Discussion in 'Orchid Species' started by EGOISTA, Feb 13, 2012. This one was a gift from some friends two years ago, they gave me it in bloom. Last years it didn't have flowers,now it has two stems full of flowers/buds, I'm very happy. 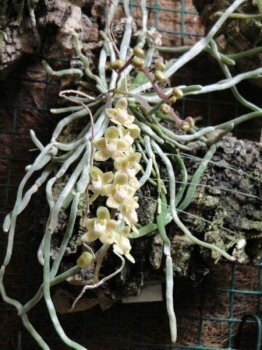 This is the first Chiloschista that I make it bloom well, Chiloschista segaway made 3 stems this year but it lost them. I grow it in very high lighted position, 18-22 C°, I Spray it every day and I allow that it dry well between waterings. Very cool. I've always enjoyed the leafless species. Congratulations, it is happy looking plant! After your info in this post, perhaps I have to move my plant into the more bright spot.